Monika has 12 years of experience in public administration, including the Chief Sanitary Inspectorate as a Director of the Department of Functional Foodstuffs. She participated in many legislative projects as well as in working groups of the Ministry of Health preparing amendments to the acts and regulations, which concerned, inter alia, advertising, pharmacy assortment, as well as umbrella branding. She has extensive experience as a regulator at the Sejm Committees level. 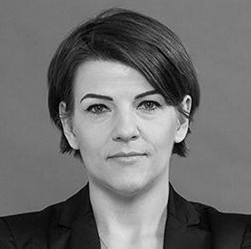 She cooperated on an ongoing basis with the European Commission within the framework of working groups including issues concerning health claims as well as regulations related to e-commerce in the field of advertising and sales through the electronic means of communication. She actively participated in the project, which was a common initiative of Italy, France and Belgium, in order to develop a uniform approach of all Member States in relations to plant ingredients in food supplements. She represented Poland as a national expert during inspections in Hungary, Germany and the Czech Republic, organized by the services of the European Commission,. As an expert in a law firm, she carried out a number of projects related to Pharmaceutical Law and the Act on Food and Nutrition Safety.